Now that you have your own TADDR, you are ready to start mining your own coins. 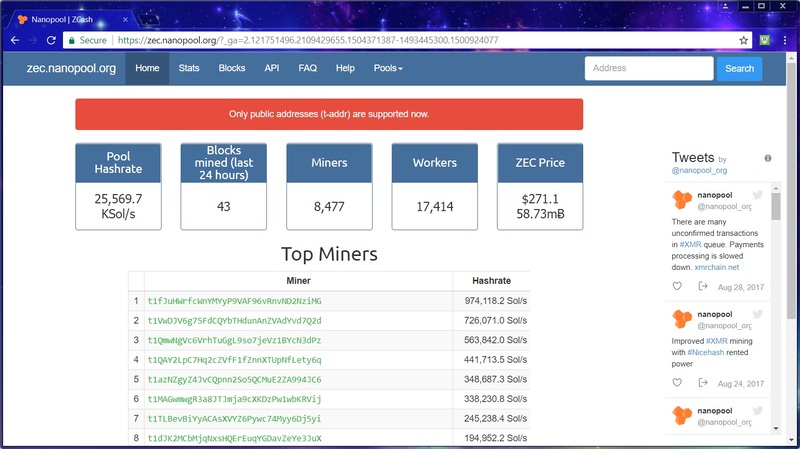 For beginners I recommend to you to start with nanopool.org since is very easy to setup and you don’t need to register, all you need is to download a miner client and your TADDR where they are going to deposit your coins and start the miner client. For people that doesn’t know what is a miner client, a miner client is the program that is use to mine in a miner pool, some miners are free and some are not (but it’s ok since are very low fees compared). You don’t need to have your node synchronized, this only will be required if you want to move your money out of your wallet. You need to know which type of GPU you have if it is AMD or Nvidia, you need this because some miner clients only works with specific type of cards. Can I use a laptop which has a dedicated GPU? Yes, you can do and I only tested with GPU’s of minimum 2GB of ram. I’m assuming you are using Windows to start mining, for how to mine using Linux I don’t cover this now but later on I’ll show you how to do so. Number of people that is mining in the pool. 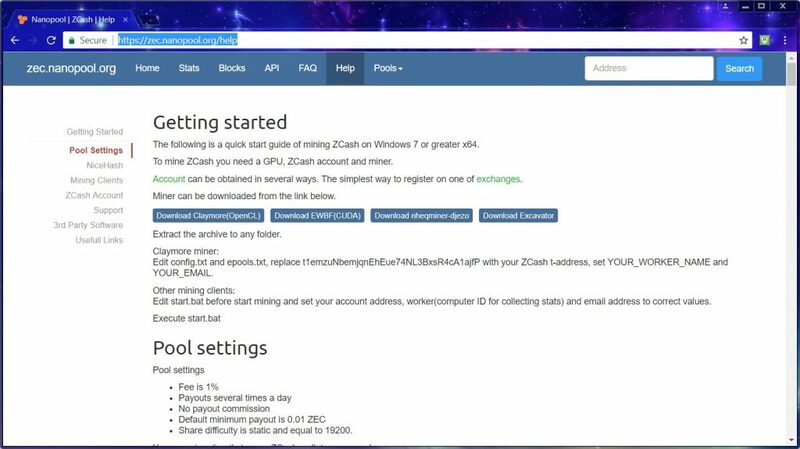 2.- Download the miner client, here zec.nanopool.org/help you can download directly the miner that fits your situation or expectation. Also they give you explanation of how to use them etc. Now here is my suggestion: I recommend to you to use either Claymore (for AMD GPU’s) or EWBF (For Nvidia GPU’s), these two miner clients have a fee of 2% which is not much I can tell you, why don’t use other miners? even that they are free you will get a very low mining hash rate, so the optimized miners I suggesting you are the best bet. 3.- Once you have your client in your pc, let’s see what is the closest Nanopool server to mine. In my case I’m located in the east side so I’m using zec-us-east1.nanopool.org. Also you have to use a number port which its going to be 6666. At this point you have everything you need to start mining, they only one thing left is that you need to configure and tell the miner client about your address, server etc. I will show you how to mine using EWFB (since I have a nvidia), also using a laptop, of course if you have a desktop with a powerful GPU like GTX1080 you will see a huge difference of the mining hash rate. My laptop has a hashrate of 33H/s average. 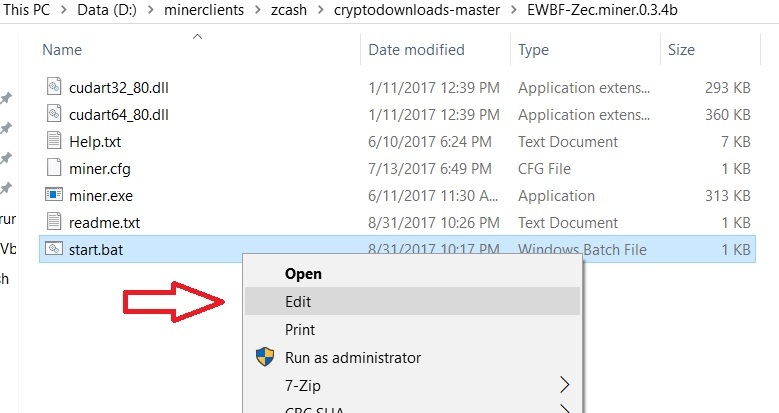 Before you do this make sure you create the folder which you want to extract the files, in my case I created a new folder “D:\minerclients\zcash”. After you are done, go to the location you extracted the file. 3.- Extract the miner client. 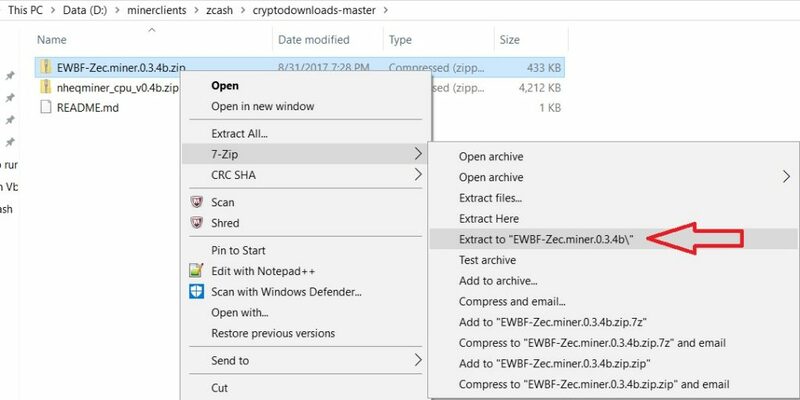 4.- Open the folder of the miners, and you will see the files that are shown in the image below. We are going to focus on start.bat only, before you edit I recommend to you to make a copy/backup of it just in case you mess up something. Do right click on “start.bat” and select “Edit”. Enter your wallet address along with the worker name (which is whatever name you want) and email, make sure you use a valid email because they send you notifications for example if your worker stop working. Leave the other things as it is. 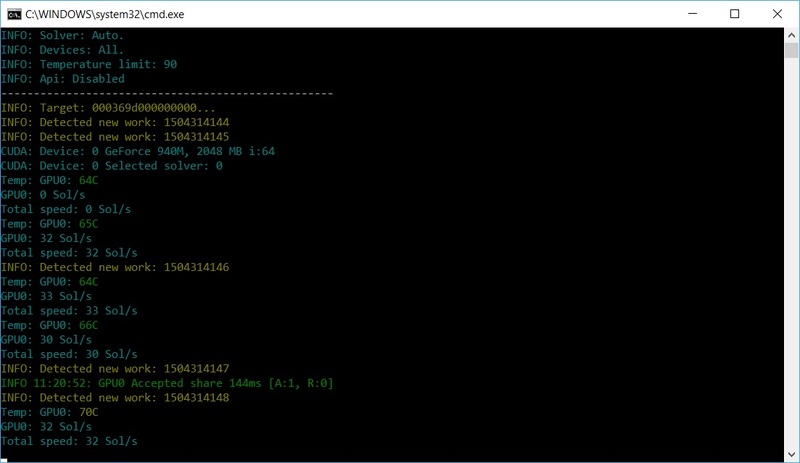 4.- Start your client miner by executing “start.bat”, you will see something like this. If you want to stop it, just close the window.